HI all, I'm located in Denver, CO. I'm very interested in purchasing an older Evora and have found a few on the internet that I find tempting. My problem, however, is that I have never been in one! The rarity of these vehicles means there is literally nothing for sale anywhere I can see in Denver to go look at except for a single new 2018 which seems like it might not be apples to apples at this point. 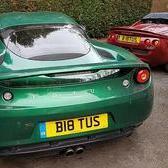 Is there any chance there is someone on the forums that lives in the area with an older model Evora who would be interested in showing off their ride? It would be highly appreciated and I'd be happy to buy you a beer or something. If this is a weird request, can anyone think of a better way of me to do this? @Vulcan Grey is in Denver, he may know of some local Evora owners? There is a Lotus Colorado club that meets in Denver and golden often. The previous club president Peter has an early Evora. You should contact the club, and I can send you a contact email address in a PM. And thanks @Bibs, for moving this to the right place and pointing Vulcan grey here. Much appreciated. Sent you a PM, check your mail.